THANK YOU!! We are already at 75,000 signatures! 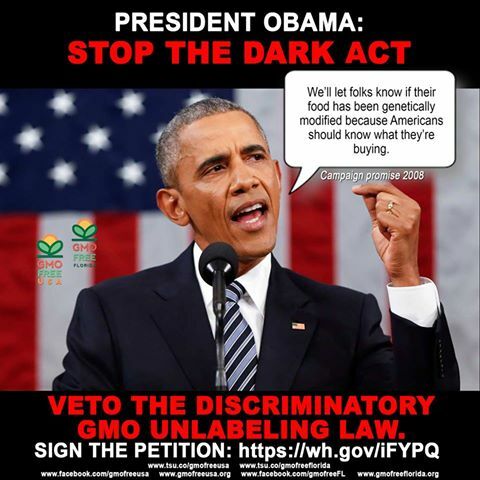 Help us VETO DARK ACT! The UNlabeling bill –We need 24,481 Signatures. Sign & Call today! PLEASE SIGN & CALL TODAY! SAVE GMO LABELING! THIS IS A NATIONAL ACTION! On July 7, the Senate passed a bill to label genetically modified foods allowing companies to use QR codes instead of words on the package. It discriminates against low income families, minorities, mothers, seniors, the disabled & those without smartphones. ALL Americans should know what they’re buying, not just the privileged. Only 21% of Americans surveyed have scanned QR codes; QR code software must be downloaded. Just 27% of seniors & 50% of low income Americans own smartphones. 42% of Blacks & 36% of Latinos have had to let their smartphone service lapse. President Obama: Stand up for ALL Americans. Veto this discriminatory bill. © 2019 Gmo Free Florida. All Rights Reserved.